Where will you find one of the best-kept secrets for a no-cost day-long vacation getaway? Right in the middle of the City of Nanaimo! Pack a lunch and head for one of three main entrances to the Linley Valley, and get ready to enjoy the sense of being away in the heart of the valley. The Linley Valley, a hidden gem of several hundred unspoiled acres, is tucked between Rock City Road on the south, Burma Road on the north, Hammond Bay Road on the east, and Rutherford Road on the west yet once you hike into the valley, you will feel like you could be far away from the city. You can spend just an hour or two following a main trail, or you can spend several hours exploring an inter-linking network of trails that meander through cool dark forests, and open woodlands, follow several creek tributaries, or up and around mossy bluffs with panoramic views. Stop for some quiet time beside tranquil Cottle Lake - home to ducks and geese, and a resident population of Cutthroat trout. 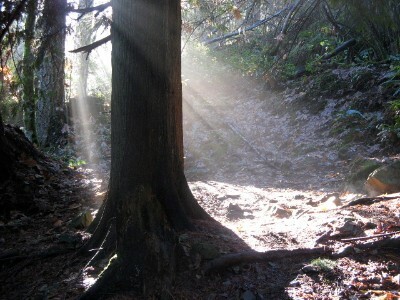 For the Nanaimo & Area Land Trust, protecting the LinleyValley has always been a top priority. When NALT was incorporated as a society in 1995, many of the founding members had previously been members of the Linley Valley Park Committee. For 10 years, long before the Nanaimo & Area Land Trust was created, this group maintained communications with the owners of Section #13, and with Nanaimo City Council, and waited for the right time to work with both parties to ensure that the property would be protected as parkland. In the spring of 2001 that time finally came to pass says Barbara Hourston, founding member of both the Friends of Linley Valley and NALT. The campaign was a wonderful outcome to the persistence of many community people who have long recognized the importance of securing this large natural area as a park. From 2001 to 2003, NALT led a major campaign to secure this part of the valley for City park, and raised $500,000 towards the purchase of the property. The City came onside in the fall of 2002 and added $1,600,000 to the purchase price. The City's Linley Valley Park Management Plan at the City of Nanaimo website states that the park will remain in a natural state with minimal changes or upgrades in the fore-seeable future. The LinleyValley, part of which is now a City park, is still a well kept secret to many Nanaimo residents and visitors. With a total area of several hundreds of acres still-undeveloped, it is the last large intact land within the boundary of the City of Nanaimo. The City park portion (previously called Section 13) consists of 145 acres located in the center of the valley. It features a mix of mature Douglas fir forest with several majestic old growth trees, open meadows and mixed woodlands, sun-drenched bluffs, creek tributaries and hidden wetlands. At the centre of the park is tranquil CottleLake. East of the park boundary (and downstream from the lake) is a 250-acre block of BC Crown land known as DL 56. This part of the valley is more heavily forested with mature trees, and ringed by high bluffs on the north and south sides. In 2010 the majority of this parcel of Crown Land was designated as protected Coastal Douglas Fir ecosystem. Combined with the Park land this results in a protected area of just under 400 acres in the centre of a growing city! The community enjoys the use of the crown land as much as the park for hiking and wildlife-watching. The valley supports an abundance of wildlife - including deer, beavers, red-legged and tree frogs, salamanders and other amphibians, a wide variety of dragonflies around the lake shore, a variety of bird species including bald eagles, hawks, owls, turkey vultures, waterfowl and some of the rarest songbirds in the Nanaimo area. The LinleyValley is one of the most intact and productive habitats left in the Nanaimo lowlands, states naturalist Guy Monty. The diversity and number of migratory songbirds nesting in this area is truly staggering. There is no doubt that this area contains habitat values truly deserving of conservation.